In CounterGo, you can now include images when you’re doing a layout of countertops on slabs. For natural stone with lots of movement, this lets you figure out if the seams will work. And, having an image will help your customers visualize their countertops. Then, click the Browse… button to choose a slab image. 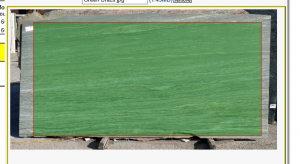 Once you’ve chosen a slab, use your mouse to select the part of the picture you want to be used on the slab layout. Then, you can lay out the countertops on the slabs with images, make sure the seams work with the movement on the slabs, and then save the quote, drawing, and layout along with the images. It’s also possible to print the image on the quote by editing the printable form. Are we able to rotate the images of the granite, to truly take advantage of your new seaming pkg.?? Like you said, I think it’s a great start… and we’ll keep working. Any other suggestions would be great! Harry, I just purchased Slab Smith!!!!! 🙁 I wish you had told me you were doing this before…. I will give it a go and let you know my thoughts. SlabSmith solves a different part of the problem – their solution goes all the way to production with super accuracy and calibration. We’re just trying to improve the pre-sales process. But, I’m really curious about how we can keep making it better, and maybe even tie into SlabSmith. Let me know what you think! Is there an easy way to print or email the layout to show the client? There’s not a way to print the picture on the slab, but you can include the image on the drawing. Any more suggestions you’ve got would be awesome… we’ll keep working on it! Hi, we are a stone fabricator based in Australia. We are after a software that can enable us take images of slabs and indicate with measurements on the software to optimise usage of slabs and vein match joins. We do not own a Cnc saw but an old bridge saw. So, we would need the software show us exact measurements on the images on screen so we could use them to cut on manual bridge saw. Hope I have put it in words that makes sense. Will your software help us with that? CounterGo is intended to be used as a quoting tool. Even though it might be possible to use it for simple shop drawings and approximate layout, it probably won’t work in every case. For example, we treat all slabs as perfect rectangles and when you’re making corners in CounterGo, we only have 90′, 45′ and 22.5′ angles. The idea is to make the drawings and layouts accurate enough to give a price to a customer, but our main focus is making them fast and easy to produce. But, I’m guessing you’re doing this by hand now, so CounterGo might actually be easier and better than how you’re currently figuring out the slab layout. We’ll email you to continue the conversation. Thanks for the question!